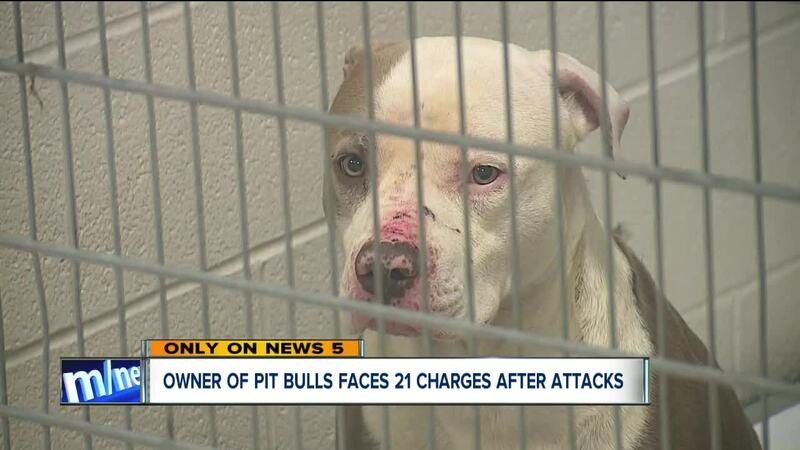 AKRON, Ohio — An Akron woman with a history of failing to control her pit bulls is facing a slew of new charges after her dogs bit several people during unprovoked attacks. Several people who were attacked by the dogs were also in the courtroom, including Sarah Friddle, a social worker. On March 4, Friddle stopped on Reed Avenue to visit a patient, but when she stepped out of her car, a pack of three roaming pit bulls charged after her and latched onto her body. She suffered multiple, deep bite marks on her legs. A few hours later, Betty Bennett, 57, was mauled by the same dogs shortly after she stepped off a bus near the intersection of Milton Street and Roscoe Avenue. She sustained severe bite marks on her arms and legs and hair was ripped from her scalp.